The Hubble Space Telescope's near-infrared vision is hot on the trail of a possible planetary companion to a relatively bright young brown dwarf located 225 light-years away in the southern constellation Hydra. Astronomers at the European Southern Observatory's Very Large Telescope (VLT) in Chile detected the planet candidate in April 2004 with infrared observations. The astronomers spotted a faint companion object to the brown dwarf, called 2MASSWJ 1207334-393254 (2M1207). SAN DIEGO -- Astronomers are highly confident that they've taken the first photograph of a planet outside our solar system. A new image from the Hubble Space Telescope confirms with a high degree of confidence a picture made previously by astronomers at the European Southern Observatory (ESO) and reported by SPACE.com in September. The planet -- still just a candidate, actually -- is an odd duck in many respects. It does not orbit a normal star, and it is much more massive than the largest planets in our solar system. Still, if confirmed, it represents a landmark in astronomy along the road to the ultimate goal of finding and photographing Earth-like planets around other stars. The Hubble image was released here today at a meeting of the American Astronomical Society. 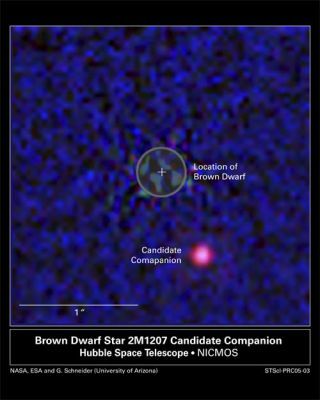 The planet candidate appears to orbit a failed star known as a brown dwarf. The initial observations at ESO's Very Large Telescope could not determine whether the apparent planet was actually at the same distance as the brown dwarf or if it was a background object. The Hubble observations show that the two indeed appear to be travelling together through the sky, suggesting they are gravitationally bound, as originally suspected. University of Arizona astronomer Glenn Schneider, who led the new study, said he's 99.1 percent sure the object is in orbit around the brown dwarf. He expects to be 99.9 percent sure in April when more Hubble observations are made as the planet presumably moves a bit farther along in its orbit. "Stay tuned for the final confirmation, but it's looking pretty good," Schneider said. The planet candidate is about 1.5 times the diameter of Jupiter and about five times as massive. It orbits the brown dwarf star at about 30 percent farther than Pluto is from our Sun. The brown dwarf does not have enough mass to trigger thermonuclear fusion and shine like a normal star, but it is also outside the realm of planethood, being some 25 times more massive than Jupiter and glowing with infrared light. The setup is about 225 light-years away. "This is the first image of a planet outside our solar system," said UCLA astronomer Eric Becklin, quickly correcting himself to say it was an image most likely to be of an extrasolar planet. "So we really need to be sure." Becklin and others eagerly await the April observations. If confirmed, the finding would have "enormous impact" on the ability of astronomers to get funding for future telescopes that would look for Earth-like planets, said Steve Maran, press officer of the American Astronomical Society. And what to make of a planet orbiting a failed star? Astronomers are already debating what constitutes a planet and whether the definition should include how they formed versus what they orbit. Becklin, who was not involved in the imaging, said there is evidence for planets orbiting planets and planets floating alone in space with no star. If the latest image is proved to be what it seems, that would suggest "planets are around a lot of things," he said.